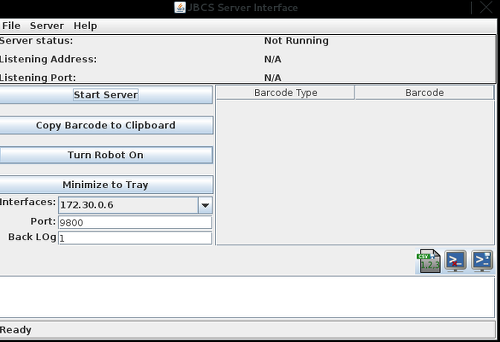 This java application allows the capturing of bar code data from the JBCS-Client. In addition, The value received can be copied to the clipboard, or auto typed by the robot. Note that if the robot is turned on, make sure to have the cursor in the text field of the application you wish to have the robot type. 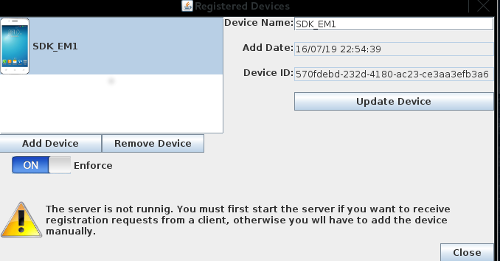 The server also has a device registration system built in. This feature allows restriction of of devices that can send barcode values to the server. This feature is turned off by default and must be configured by the user. Make sure to not start the server using the 127.0.0.1 interface address. Doing so will prevent the client from sending information to the server. A warning message will pop up to warn you if the server is started on this interface. This interface is used for debugging purposes only. When the server is stopped via the stop server button, the server will throw a “Socket Closed Exception”, and a stack trace will be printed to the debug-report file. If you know you shut the server down via this method, you may ignore these stack-traces in the report. This has been documented in the source code as well. When this feature is turned on, it allows the robot to simulate typing of the received barcode on your computer. If you have a text cursor in a text box on another program, the robot can type out the value into the text box. The robot will only type when a barcode value is received from the client. 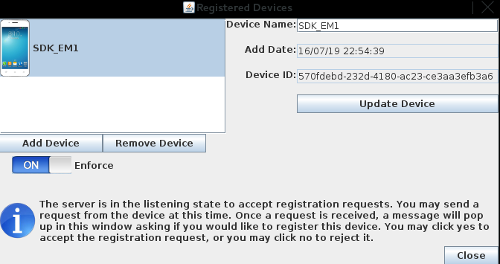 The registration system allows for registering android devices with the server. The android client uses a 128 bit UUID to identify itself with the server. If this feature is turned on, The server will tell the client that this feature is enforced and ask the client to send it's UUID. If the client's UUID is registered with the server, the server will accept the barcode data sent from the client. 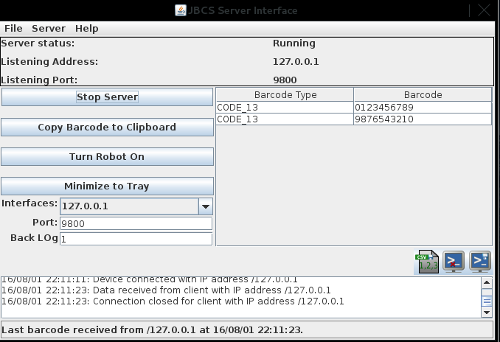 If the client's UUID is not registered with the server, the server responds back indicating that the client is not registered and will not except the barcode value from the client. Note that if this feature is not enforced, the client may send it's barcode data with out being registered with the server. The application adds a system tray icon to the system tray. You can minimize the window to the system tray, and retrieve it by right clicking on the tray icon and clicking "Show Interface". You can also start/stop the server and robot from the tray icon, and exit the application as well.